Harvard Common Press, 9780760363430, 208pp. 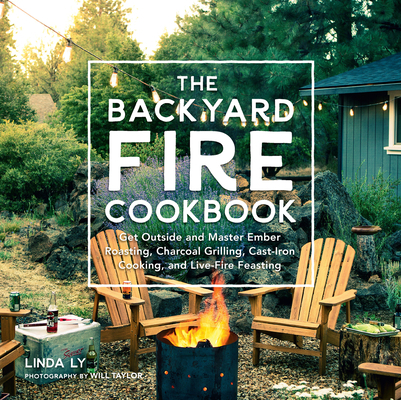 There's no denying the thrill of cooking outdoors and the sense of community it brings when people gather around a fire, and in this book, author Linda Ly will teach you how to master the flames. For the adventurous, start by building a home fire pit. It's easier than it sounds and requires minimal investment of time and space. If you'd rather not, that's okay! There are plenty of other options, from vessel fire pits to tabletop grills. Even a charcoal kettle grill will give you more flavor than cooking with gas. Ly also covers everything you need to know about fuel sources (hardwood, hardwood lump charcoal, and smoking wood), her go-to grilling tools and accessories, secrets for stocking an indoor and outdoor pantry, fire making, fire safety, and tips and tricks for grilling more efficiently. You can choose your own adventure with over 70 recipes for ember roasting, wood-fired cooking, charcoal grilling, and foil pack meals. Next-level techniques like dutch oven cooking, grilling a la plancha, and plank grilling are all part of the fun, too. With modern twists on classics and globally-inspired meals like Smoky Ember-Roasted Eggplant Dip, Thai Chicken Pizza with Sweet Chili Sauce, Grilled Oysters with Kimchi Butter, Bacon-Wrapped Meatloaf on a Plank, and Artichoke, Sun-Dried Tomato, and Feta Stuffed Flank Steak, you’ll find a recipe for almost every occasion. This is not a book about low-and-slow barbecue, and you won't find overnight marinades or complicated recipes, either. Ly aims to encourage easy, accessible grilling that you look forward to doing on a weeknight because, quite simply, food just tastes better outside. Whether you're a seasoned home cook or a novice on the grill, The Backyard Fire Cookbook will help you make the backyard your new kitchen.